For this week’s Sketch Sunday, I went with a sketch from the My Favorite Things’ sketch challenge (which can be found here – http://www.cardchallenges.com/search/label/sketchchallenge). Since I organized my stamps (but didn’t bring them upstairs to the craft room yet! ), I went though them as I sat and watched tv tonight. I found a couple of sets that hadn’t ever been used or had only been used once. I then looked at the sketch and realized that I needed some paper for the background. For the 4 1/4″ x 5 1/2″ white card base, I used some white Recollections 65 lb card stock. I knew I wanted to use the cassette tape die from MFT that has been in my stash for so long, unused! I cut the bottom layer out of black card stock from Recollections and the label from the same white as the base. I also stamped the label from the MFT Journal It Playlist in Hero Arts Shadow Ink in Pale Tomato. 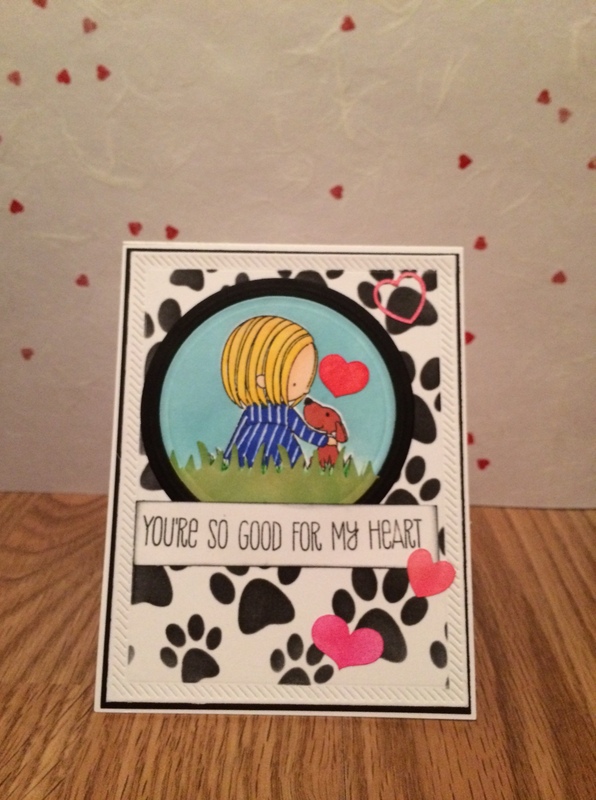 For the background of the card, I thought I wanted something with hearts because I wanted to create a love/Valentine’s day card. I was looking for some vellum that was leftover from the wedding invitations that I did for my friend Alicia and came across something under my desk that changed the theme of the card. 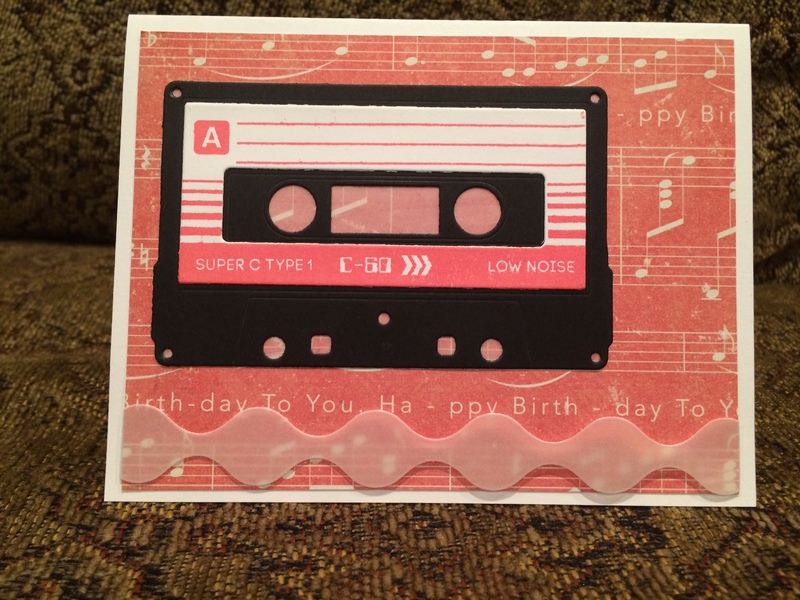 When I saw that the Crate Paper Party Day paper had music notes with “Happy Birthday”, I changed focus. I now needed a new sentiment, so I dug through my stamp sets. I couldn’t find any ready made sentiments that I liked, so I made my own! 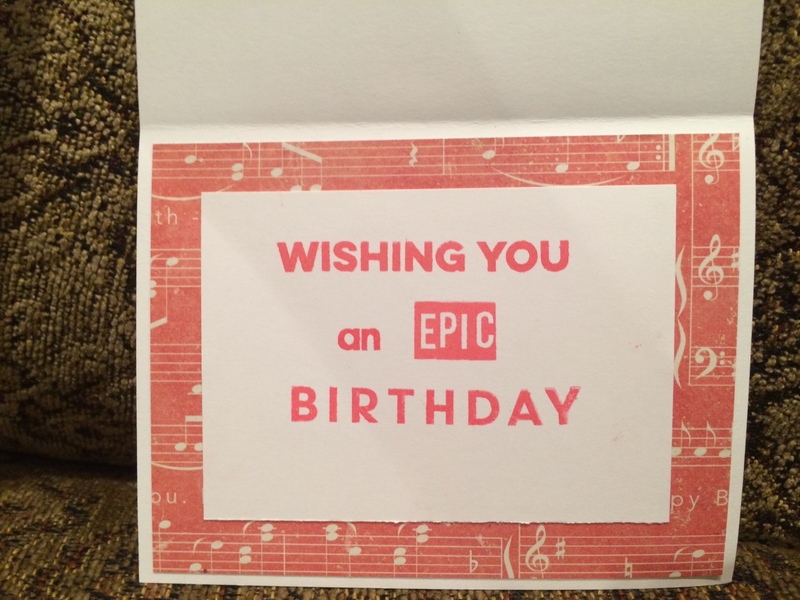 First, I saw the word “EPIC” in the Journal It Playlist stamp set from My Favorite Things and decided I wanted it to say “Wishing You an epic birthday”. Next I found the “Wishing You” from the MFT Merry Messages stamp set and the “Birthday” from the MFT Delicious Birthday stamp set. The “an” was more difficult to get, but I finally found the sentiment “You Are an” in the MFT Be Original set. Lastly, I stamped these all in Hero Arts Shadow Ink in Pale Tomato on some white Recollections card stock. I then mounted that on some of the same Crate Paper that I used for the front of the card. To finish off the front of the card I used the MFT Jumbo Squiggle Border die with some vellum to make the scallop design that is at the bottom of the sketch. I also cut a piece of vellum that was a little bit smaller than the cassette tape die cut so that there was a backing to the tape. Posted in card making, Challenge, ideas and tagged birthday card, black, card inspiration, cards, crate paper, creating a card from a sketch, My favorite things, pale red, party day, scrapsecrets, stamp sets, wafer thin dies, white. Bookmark the permalink. Since I just wrote a guest blog post for Craftynotshifty.wordpress.com, I am just going to post the YouTube video for Sketch Sunday. Go over to her blog in a couple of days to catch the post on this video! Posted in card making, sketch sunday and tagged ATG, card inspiration, cards, creating a card from a sketch, creative, Creativity, My favorite things, Pure Innocence stamps, using new supplies, using your supplies. Bookmark the permalink. For my card I used the Lawn Fawn Journaling die to cut out some Canson XL 140 lb watercolor paper. 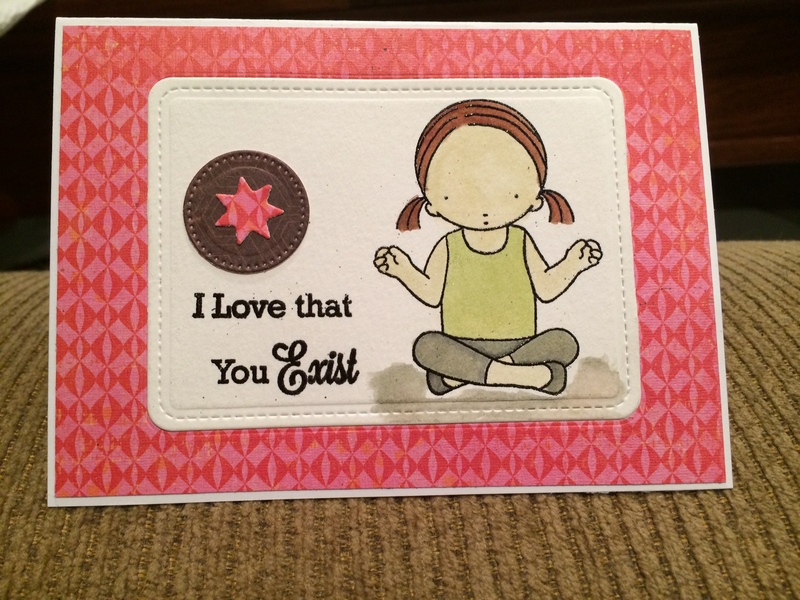 I used girl from the Pure Innocence Serenity stamp set and stamped her with some Versamark ink. I heat set it with some Ebony embossing powder from Recollections. 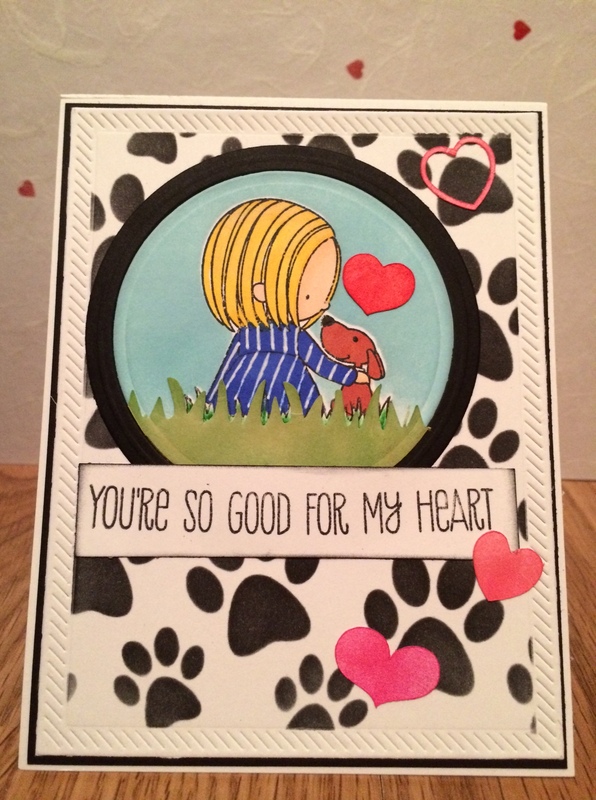 I stamped the sentiment from the MFT You Make the Day stamp set and heat set it with the same Ebony embossing powder. I used the same journaling die to cut out the middle of a piece of Crate Paper designer paper so that I could inlay the watercolor piece into it. I also die cut a stitched circle and a star from Sizzix and Lifestyle crafts. Then I assembled the card on a 4″ x 5 1/2″ card base. To see the video, click here: http://youtu.be/xuyXjhnoZW0. Thank you for stopping by! Feel free to leave comments or questions and subscribe! Posted in card making, Challenge and tagged card challenges, card inspiration, chelebelle1120, Crate Paper designer paper, creating a card from a sketch, inspiration, lawn fawn, Lifestyle crafts star dies, MFT Card Challenge, My Favorite Things Stamp set, Pure Innocence Serenity stamp set, scrapsecrets, Sizzix card #2 stitched circle die, stitched journaling die, using sketches for inspiration, YouTube video. Bookmark the permalink.